Miami, Florida — August 13, 2018 — Your top priority as a parent or grandparent is to protect the children you love. To help you do that, Debra Holtzman, J.D., M.A., a nationally recognized child safety and health expert, with over 20+ years of experience, has written the ultimate new parenting resource: The Safe Baby: A Do-It-Yourself Guide to Home Safety and Healthy Living (Sentient Publications, 2018). This comprehensive, readable, and empowering book tells you how to make your home and environment safe for kids. Debra Holtzman, J.D., M.A. has made hundreds of media appearances including NBC’s Today Show, Weekend Today, ABC World News, Dr. Oz, The Good Life, and USA Weekend Magazine. She was the official on-camera safety expert for the weekly Discovery Health series, “Make Room for Baby”. Debra is the author of four published child safety and health books and is regularly quoted in newspapers, magazines and blogs throughout the world. She was named an “Everyday Hero” by Reader’s Digest and a “Woman Making A Difference” by Family Circle Magazine. She has a law degree and an M.A. in occupational health and safety. Debra is also a certified child passenger safety technician and teaches infant and toddler safety and CPR classes. 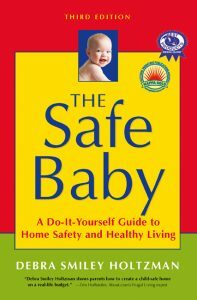 The Safe Baby: A Do-It-Yourself Guide to Home Safety and Healthy Living is available wherever books are sold.